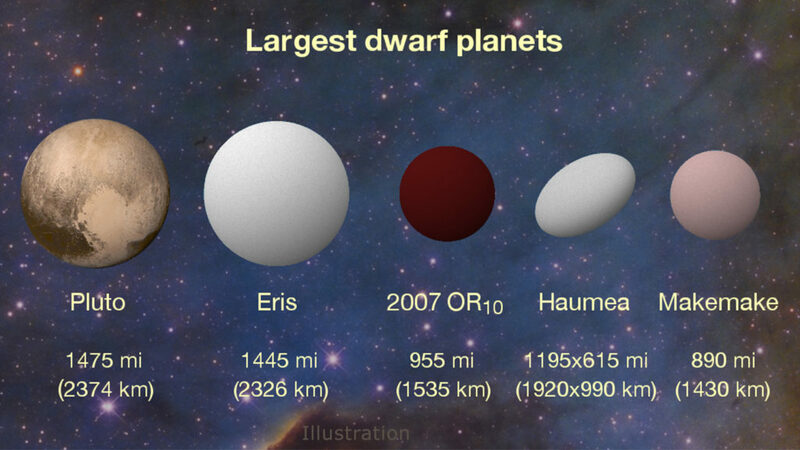 May 11, 2016 – Dwarf planets tend to be a mysterious bunch. With the exception of Ceres, which resides in the main asteroid belt between Mars and Jupiter, all members of this class of minor planets in our solar system lurk in the depths beyond Neptune. They are far from Earth – small and cold – which makes them difficult to observe, even with large telescopes. So it’s little wonder astronomers only discovered most of them in the past decade or so. Pluto is a prime example of this elusiveness. Before NASA’s New Horizons spacecraft visited it in 2015, the largest of the dwarf planets had appeared as little more than a fuzzy blob, even to the keen-eyed Hubble Space Telescope. Given the inherent challenges in trying to observe these far-flung worlds, astronomers often need to combine data from a variety of sources in order to tease out basic details about their properties. The results show 2007 OR10 is the largest unnamed world in our solar system and the third largest of the current roster of about half a dozen dwarf planets. The study also found that the object is quite dark and rotating more slowly than almost any other body orbiting our sun, taking close to 45 hours to complete its daily spin.